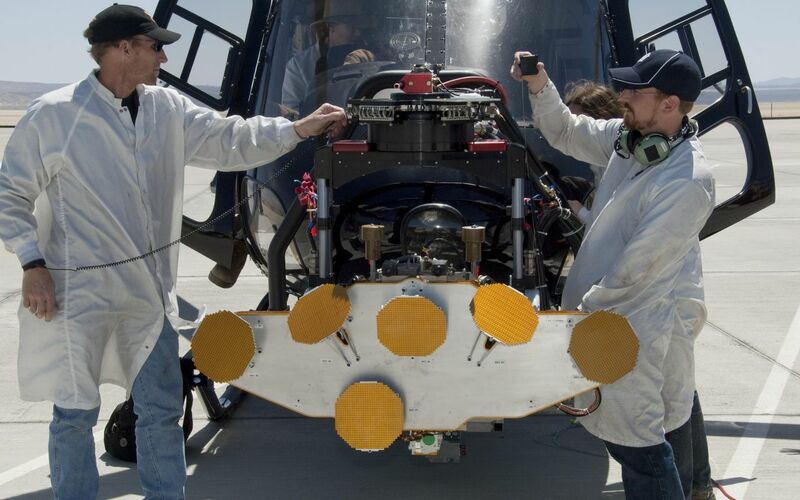 In advance of a testing flight at NASA Dryden Flight Research Center, members of the test team prepare the engineering model of the Mars Science Laboratory descent radar on the nose gimbal of a helicopter. The yellow disks are the radar's antennae. 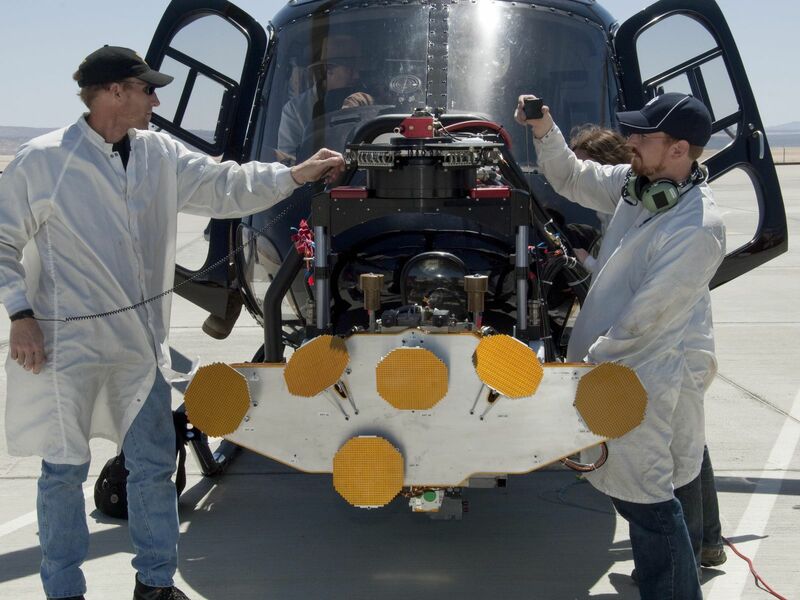 From left, the team members pictured are Brian Lataille, of Wolfe Air Aviation, Pasadena, Calif.; Scott Shaffer (inside the helicopter), NASA Jet Propulsion Laboratory, Pasadena; Charles Fisher, JPL; Hannah Goldberg (behind Fisher), JPL. 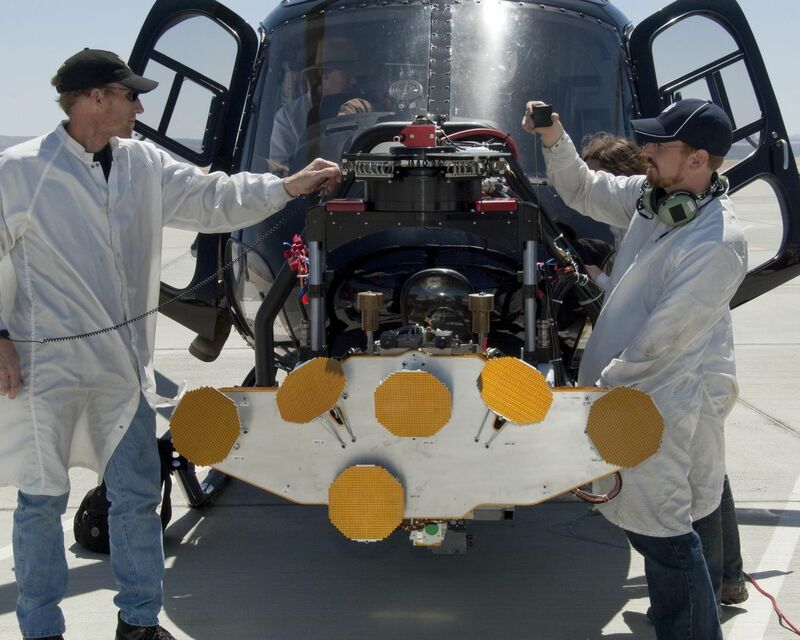 The helicopter carrying the test radar flew pre-planned flight trajectories over Rogers Dry Lake at Edwards Air Force Base to simulate the rover's descent stage carrying the Mars rover Curiosity to the surface of Mars in August 2012. Wolfe Air provided the Eurocopter AS350 helicopter and crew for the tests. The helicopter's Gyron gimbal mounting system, provided by Nettmann Systems International, usually carries aerial video camera equipment for the motion picture industry. NASA's Jet Propulsion Laboratory, a division of the California Institute of Technology in Pasadena, manages the Mars Science Laboratory Project for NASA's Science Mission Directorate, Washington. The project will launch Curiosity in late 2011 on a mission to one of the most intriguing areas on Mars, where it will investigate whether conditions have favored development of microbial life and preservation of evidence for life in the rock record.